The past couple of months appear to have been very active with supposed “research chemical” sites closing down. For those unfamiliar, the businesses I am referring to sell nonscheduled and unclassified drugs such as antiestrogens, aromatase inhibitors, and IGF-1/GH analogs. These drugs are normally sold only by prescription, or in the case of unclassified new drugs, are not approved for human use. These businesses try to operate in a grey area, as true scientists are able to obtain non-controlled chemicals for research purposes. No special license is needed, but the drugs are never meant for human consumption. Far removed from this context, the companies I am talking about here openly advertise their “research” products on websites and in magazines for bodybuilders. Aside from an often ignored disclaimer, there is little to make one believe these drugs are not being used for human bodybuilding purposes. In some cases, the drugs have even come in flavored solutions! With a very busy workload, law enforcement often takes some time to get around to closing these rogue research chemical sites. The penalties for such crimes are strict, but in the grand scheme of things, the crimes are not as disturbing to the law as many others. These business also usually stay pretty low on the radar. We can understand why there always seems to be a few of them around. Lately, however, law enforcement may have been very active in closing them down. In the past couple of months, it seems most of the known sites have suddenly gone offline. While we don’t know the details in all of these cases, a source just confirmed for Body of Science that GoPeptides in particular has been raided by Federal authorities. At least in this instance, we have been told that law enforcement was involved. GoPeptides wasn’t exactly short on publicity though. 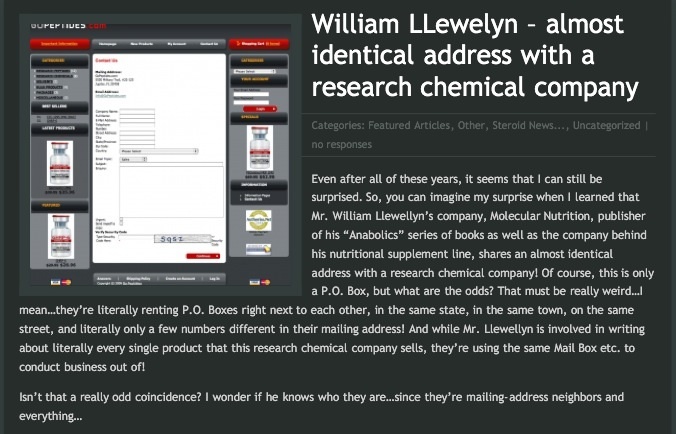 They were becoming well known on certain bodybuilding websites, and earlier this year, underground blogger Anthony Roberts even wrote an article alluding to the fact that I (William Llewellyn) may be the owner of the operation. This apparently was based on the fact that GoProteins rents a box for their business at the same facility I do. I thought about addressing this post at the time, but figured it would do no good to deny it (everyone guilty denies it, right?). Authorities would find out quickly enough it wasn’t me when they arrested the owner. Today, we were informed that indeed the owner was arrested, and may now be facing serious Federal charges (no further details on the nature of the charges have been provided). Roberts may be happy to learn he has some big fans in law enforcement. Our source also told us they had been reading his article.